Everyone has heard the phrase “in the cloud”. Those white puff balls floating over head seriously contain a massive amount of information – enough to win wars and impeach presidents. While it’s fun to think that the condensed air balls forming animal shapes high in the sky are what’s keeping all of our information safe, the Cloud is actually a bit more complicated. And even more so when you add artificial intelligence (AI) to the equation. 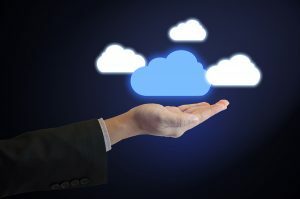 For tons of reasons, many companies already have or are in the process of migrating to the cloud. But some are taking it a step further and focusing on innovating from the cloud with artificial intelligence. You see, the Cloud is the underlying platform with the data storage capacity and massive processing capability that will help enable AI innovation at the speed demanded. Companies are already starting to integrate a variety of AI-driven technologies across voice, vision, language and machine learning in order to transform their businesses. Artificial intelligence simplifies and enhances peoples’ experiences with technology. It allows people to communicate with more natural interfaces like conversation. Consumers are able to use their voice to ask their phone for directions, a virtual assistant to turn off the lights, and an automated system for a bill pay reminder. Having a solid strategy for implementing these AI technologies, companies will be able to capitalise on a hyper-personal engagement journey with both customers and employees, increasing loyalty and therefore increasing wallet share. However, building and implementing AI solutions is not easy—and it must be done responsibly. Since the cloud is the foundation of AI, every company must choose their public cloud platform provider wisely to help ensure that future innovation in AI will be supported. Amazon Web Services (AWS) has released Amazon Lex, a conversational engine that makes it easier for companies to build chat bots, Amazon Polly, to generate voice-like output, Amazon Rekognition, for building computer vision solutions and Amazon Machine Learning, which uses well-defined algorithms to teach machines to make better predictions. At VoiceFoundry, we partner with the best in the market to deliver dynamic interactions for customers. We are experts in deploying Amazon Connect, a cloud-based enterprise contact centre solution, as well as other Amazon products that focus on creating customer interactions. Our team is equipped with best practices and a methodology to make moving to Amazon Connect a great experience. We are focused on understanding your business model and how you envision your customer experience so that we can deliver the right solutions and applications to meet your requirements. We have the right mix of expert knowledge and innovative products with Amazon Web Services to make your vision a reality. Contact us today to find out more.